If you have been to Vegas over the past few years, you will no doubt have seen the explosion in the numbers of Quick Hit games that have appeared and are being enjoyed by people. Here, we have have a free version of one of the biggest Quick Hit games ever - the Triple Cash Wheel Quick Hit slots. Enjoy! Everything is tripled in Triple Cash Wheel, starting from the set of reels to the payline system, divided into three simultaneous games: Game 1, Game 2 and Game 3. Thanks to the upgraded structure, Bally manages to escape the conventionality and predictability of the traditional fruit machine layout and provide a unique gameplay - something most of the players do not think is possible with slots that feature Cherries, Bells, 7s and Bars as the main symbols. Launching the game will immediately activate three game screens, each with a separate reel system and 20 paylines – 60 in total. The number of lines and screens is fixed and you will be playing on all 15 reels and 60 stake lines on every single spin, without the option to reduce the game to a single screen. Bets are selected manually and range from $1.00 to $100 on all 60 paylines; Auto mode is available and the player can activate hundreds of auto spins which can be stopped when a pre-determined payout is achieved or if a certain amount is lost. In total, the game can produce 250,000 coins and a return to player percentage of 95.21%, pulling the slot towards medium variance game category. Wild is the highest paying icon which can result in a payout of 2,500 coins for a single combination of 5. At the same time, this symbol will replace all Triple Cash icons except for the Quick Hit icon. Players who are lucky enough to land a Quick Hit combo inside a single screen can multiple their bets by at least x1 for a formation of 3 matching icons. At the very top of all three screens, three Cash Wheel icons are placed – these can become randomly highlighted after every single spin and if all three lit up at the same time, the Cash Wheel Bonus Feature is triggered. The grid with 21 tiles will be displayed prompting the player to pick between the fields in search for matching symbols. Every match will award a multiplier bundled up with a Free Spin. The main advantage of Triple Cash Wheel slot is the multiple game screen platform that the slot introduces. With a layout like that, the overly exploited theme becomes acceptable and the developer proves that the traditional fruit slots still have some life left in them. The return to player could definitely be higher and 1 - 2 % up is what keeps Triple Cash Wheel from being next to perfect. Players who are fed up with the old fruit machines look and refuse to give them a time of day will be caught by surprise with Bally's interpretation of the theme. Triple Cash is likely to change your mind about the traditional slots, thanks to its multiple reel structure and the Quick Hit payout solution that can multiple your bet by x1500. 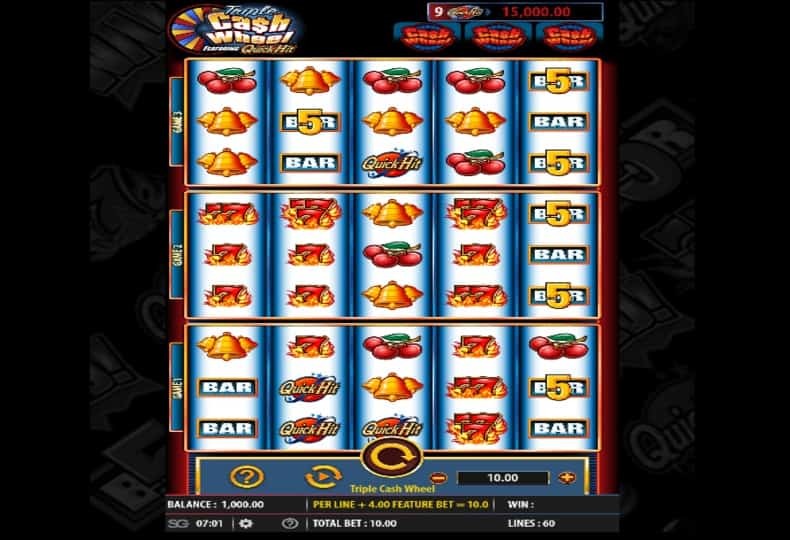 The 3 different screens will significantly increase the level of excitement as you watch how symbols fall into their places, one screen after another, while the Cash Wheel will definitely add that extra edge due to its multiplying potential.